Top Right: Egypt’s President, Mohamed Morsi appointed 21 senior aides and advisers, three of which were women. Dr. Omaima Kamel, a medical professor at Cairo University and Muslim Brotherhood member is one of those women. Top Left: Manal Abul Hassan, a leading female figure in the Muslim Brotherhood’s Freedom and Justice Party publicly attacked the December 2011 women’s march, suggesting it had been funded from abroad. The FJP women's secretary went on to state "Does she [the female protestor] not have a husband, a brother or a son to defend her?" 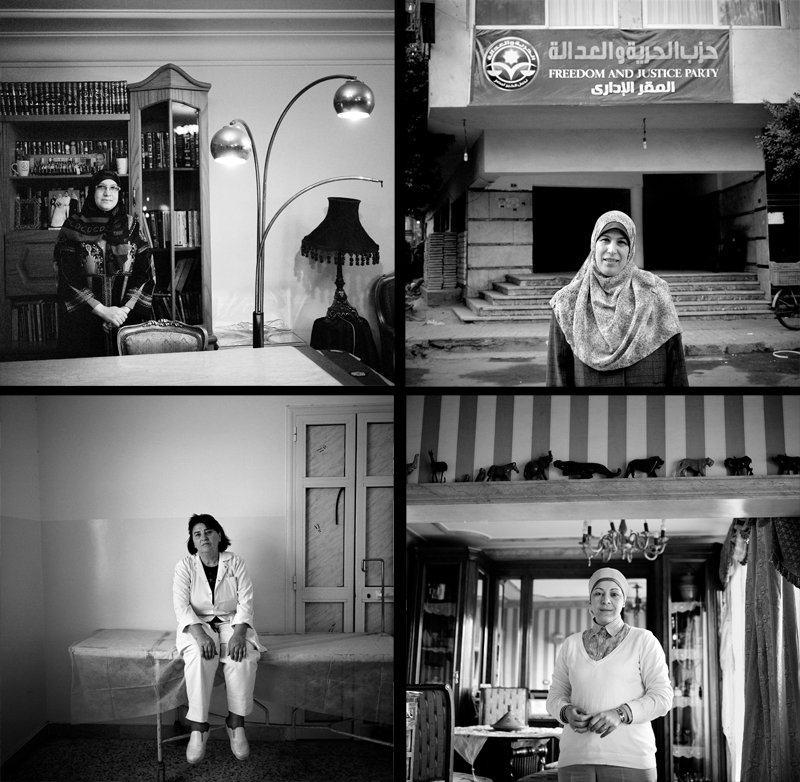 Bottom Right: Nehad Abu El-Komsan, Chairwoman at the Egyptian Center for Women’s Rights states, "The biggest hardship is convincing people we're qualified. Generally most people think women are less qualified than men. This is most people. Even though women usually have higher scores and degrees than men. It's not only qualification, it's trust on how much we'll give to our work; how much time we'll put in. People consider women a waste of time. She may work for a year or two, but once she's married and has a child she'll become lazy in the work place or leave all together. Employers think it's not worth their time training a woman because she wont be around for a long period. This is not true. Women are so dedicated, to job and to home; this is two jobs." Bottom Left: Velichka Petkova, 52, is Bulgarian and has lived in Libya for the last 17 years. Today she is working as a nurse at a clinic, which is positioned at the last rebel checkpoint before the besieged town of Bani Walid, one of the last strongholds of Gaddafi loyalists. "When the rebels took Tripoli I was working at Tripoli Central Hospital. We prepared medicine and hospital supplies for them. I was working 12 hours a day. No one knows what will happen here, if we will die."